He sat there, a handsome man in his mid-fifties, dressed in a fine suit, smelling of expensive cologne, with a gold watch on his wrist that was worth more than three months’ rent to Miranda. He had made the appointment by phone, calling himself ‘Mr. Jones,’ and from the start the itching in her brain had told her the name was a lie. Not that such things were uncommon; many people felt strange the first time they consulted someone proclaiming to be psychic. Still, it was a credit to Miranda’s authenticity that even before the tall, good-looking man had sat himself at her table in her modest apartment, she had known he was hiding something. Now she knew it was more than just his identity. “Well, Mr. Jones, what brings you here?” Miranda said with just the slightest hint of incredulity. “So again, why are you here?” Miranda’s brown eyes narrowed slightly as she studied the TV anchorman. The fact that he was still hiding something practically poured off of him. He’s either telling the truth or he’s a very talented liar, the young woman thought, as something deeper within the recesses of her mind added, he is hiding something…but what? Raymond nodded and bent down to rummage through the briefcase he had brought in with him. Straightening back up, he placed an odd bracelet of light green, almost jade-like stone on the table between them. Miranda stared at the strange bit of jewelry in front of her but made no move to touch it. It was an odd piece. Wide, thick and heavy. It would be uncomfortable to wear. It was also bizarrely carved so that it resembled a multitude of long, thin things all coiled together to form the body of the bracelet. Without a closer examination, Miranda was unable to tell what those undulating twists of green stone were meant to represent. And yet she couldn’t bring herself to pick up the strange trinket. Am I afraid of it? she wondered. Why, for God’s sake? “Did you get something already from the bracelet?” Raymond asked eagerly. Why did I just call it a thing? she wondered after she spoke. It’s just a bracelet. My God, I am afraid of it. You knew he was going to say that, so why even ask? Miranda forced a smile. “Well then, I can’t promise anything, but I’ll try my best to help you find your lost lady friend.” With that she quickly reached out and snapped up the green stone bracelet before her unreasonable dread could stop her. Now that she was holding it, Miranda was surprised at how light the jewelry was for being such a bulky thing. 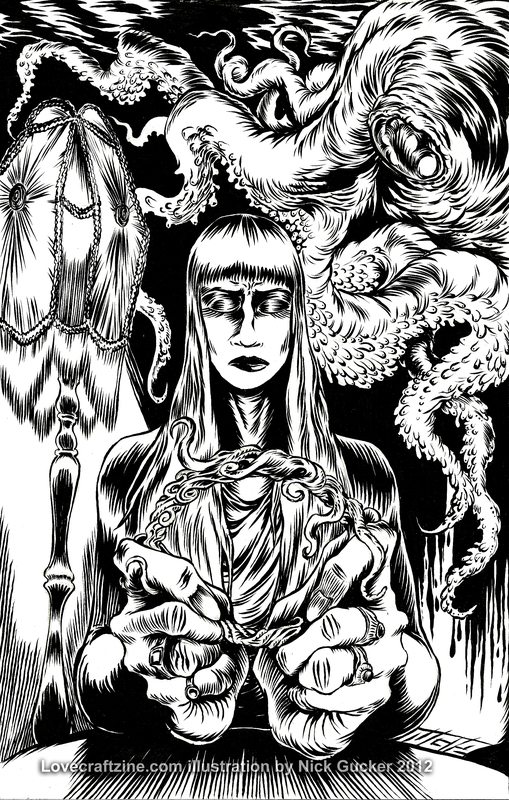 She turned it about in her hands, carefully looking at it, and came to the conclusion that the ropy coils carved into the odd green stone were meant to be countless tentacles. Upon discovering that, her opinion of this heirloom dropped from strange to downright ghastly and she couldn’t imagine anyone wanting to wear this thing. Then the center of her brain started to itch. At least, that’s what it always felt like. She had grown used to it over the years. It was her psychic gift turning on, like an old style television slowing warming up. That’s how she liked to envision it. As she held onto the weird bauble, her other five senses started to shrink away, making room for a sixth, all-encompassing one. The first sense to pick up the emanations coming from the stone loop in her hands was her sense of smell, which was always the case. Miranda sniffed a few times then wrinkled her nose in disgust as the strong scent of sea assailed her. It wasn’t the charming salt-spray of sailboats and white sandy beaches; it was the thick muck-stench of low tide, rotting fish, and decaying seaweed. “Are you getting something?” Raymond asked as he pulled his hands back from the table and brought them up to his chest: an almost comical expression of fear. “Shhhh. Yes, I am but please be quiet.” Miranda’s fingers now felt the bracelet with a psychic’s touch. Although the stone remained cold, it seemed to move and writhe in her hands. Miranda was sure she felt some of its tiny carved tentacles wrap themselves about her fingers. It was also now very damp and she could feel phantom drops of water running down her fingers, dripping off to hit the table below. Oh my God, these are the strongest images I’ve ever had while reading an item, she thought. “What is her connection to the sea?” she asked. The woman did not reply, she just sat motionless, giving herself over completely to the gift, sense by surrendering sense. But Miranda did not hear Raymond’s questions because the sound of crashing waves were now all-encompassing, as too was the taste of brine in her mouth. The last sense to fully give way to the Sight was, ironically, her vision. The simple image of the locked door that had superimposed itself upon whatever she looked at in the real world suddenly became the only real thing before her, blocking out everything else. Then the door disappeared, leaving Miranda in a darkness that her inner third eye slowly adjusted to. The terrified woman could “see” that she was in a huge chamber of some kind. But it was wrong. Everything here was all wrong. The shapes of the columns that held up the vaulted ceiling confused her. The angles of the room hurt her brain when she looked at them for too long. Everything was blurry, and yet so sharp it cut into her vision like knives. Enthralled by these logic-defying sights, Miranda didn’t notice that the sounds of the crashing waves were gone. All had become silent. That is, until she heard something heavy shift behind her. It was sprawled out upon an enormous altar-like stone as high as a two-story building and longer than two football fields placed end to end. Miranda’s third eye recoiled at the sight of it, even though she couldn’t see a complete picture of the thing that slowly stirred before her, because her brain could not process the impossible images fast enough. What she got were only sensory glimpses, like a camera flashing in a dark room. But even those brief flashes were almost more than she could take. Those two sounds were what freed Miranda from the awful vision. The first was a soft sound, like a book being shut too hard, but was in fact the sound of a silenced pistol firing. The crack was the table splintering as a piece of lead nine millimeters in diameter broke through it from below before plowing into Miranda’s abdomen just inches below her frantically beating heart. Miranda looked down and saw the blood welling out of her, turning her blue dress a darker shade. But she was none the less relieved. Then she looked up at Raymond Silver who sat across from her. One of his hands was under the table; the other rested on its top. Gone were his expressions of fear, bewilderment, and embarrassment. His tanned face was no longer handsome; it was now a mask of cold detachment. “The locked door,” was all Miranda could think to say. “What about it, Ms. Theroux?” the cold man asked. Outside Miranda’s apartment building and three blocks distant, Raymond Silver sat on a bus stop bench and waited. In one coat pocket was his pistol; in the other, his bracelet. The briefcase at his feet was stuffed with Miranda Theroux’s DVD player, her cheap jewelry, and a pair of silver picture frames. He was checking his Rolex when a police car pulled up to the curb in front of him. It was actually a limousine, but inside was the Chief of Police. Raymond grabbed his briefcase and walked to the long, black car as its driver got out, came around, and opened a rear door for him. Raymond looked inside the back of the limo at the two men within before stepping in himself. “Brother,” they both answered, as the TV anchorman sat down across from them. Inside, the Deputy Mayor handed Raymond a snifter of brandy. “How did it go?” the Police Chief asked. “Mine kept seeing ‘danger from the west’ and that I should avoid the water. But nothing more than that,” the policeman said, sipping his own brandy. “Did you take care of him?” Raymond asked. “I still think we could have waited on that one,” the politician chimed in. “Now wait a minute,” began the ‘little mayor,’ who was always quick to take offense when his faith was being questioned. Raymond knew this and decided to head him off with a question. “So how’d you do her?” the elderly cop asked with his typical heavy-handed innuendo. “Oh please,” Chief Westmore said. The old cop did like to keep his murder simple. “Who’s going to investigate this even if someone notices? You, Mr. Eleven O’clock News? Or perhaps the police?” The Chief gestured at himself with a flourish. “Cthulhu fhtagn,” the deputy Mayor added. “Cthulhu fhtagn,” the other two replied, and that ended the conversation because there was no arguing with it. This time the Grand Event was real. Everyone in the Order could feel it. This wasn’t going to be another near miss like in 1925, and this time there wasn’t going to be any ‘sensitive’ people around to warn the world. In ’25 the world was simple, but today it was anything but, and the Order couldn’t risk the off chance that a government would believe the raving artists and clairvoyants and send a fleet to await the rising of R’lyeh. So right now, all across the globe, the faithful were spreading out, finding those who had no right receiving the sacred Call, and doing away with them before the alarm could be sounded. This time everything was going to be right. The place, the time, the people. If you enjoyed this story, let Brian know by commenting — and please use the Facebook, Twitter, and Google Plus buttons below to spread the word. I enjoyed this quite a bit. I like the Order helping things along. I really like the transition and the pacing. Very good effort! Thanks, Jaime, glad you liked it. I enjoyed the growing horror as Miranda peeled away at the mystery of the bracelet, as well as the sudden, unexpected twist. Good tale. Thanks, Bruce, happy you liked it. Thanks, David, I’m so happy you liked the story. And who knows, I just might do that. Great read, looking forward to reading more of your work! This is good – enjoyed this a lot. Liked this a lot, sense of impending dread and horror, the taste of brine (makes Lovecraft shudder) great! Liked the conspiracy aspect too. Great concept- really enjoyed this. I really liked this one – kind of a Call of Cthulhu part 2, Illuminati sort of vibe to it. Thanks so much, one and all. I’m very happy that you liked the story and thanks so much for taking the time to leave some feedback. I appreciate each and every one. liked this a good deal. and i’d like more stories about this Order and its activities! A very cool, brooding tale. I really liked the bit with Miranda in the sealed chamber with Cthulhu- it really had a great atmosphere of dread. I also didn’t expect the anchorman to be a cultist, and it made for a great twist. Lovecraft would definitely approve! Thanks, Denise and Chaz.Happy to hear that you liked it. Hmm, people seem to want more of the Order, I might have to visit with them again. Thanks! This is a good story. Thanks for the feedback, Nathan. I’m happy you liked the story. Another very enjoyable story, Brian. My one criticism is that the ending bit about the conspiracy was a bit heavy handed. I particularly enjoyed the build up with the psychic; I was actually quite surprised by the climax there. Are you planning more fiction son, I hope? Fair and welcome criticism as always, Matt. Thanks for it. As for me writing more, yes I’ve been exceptionally busy as of late. Cthulhu Unbound 3 from Permuted Press should (hopefully) be out soon with a novella I co-wrote with David Conyers called “The R’lyeh Singularity”. Then there are the 4 books I’m editing (Undead & Unbound, Eldritch Chrome, Steampunk Cthulhu, and The Edge of Sundown) that will have new stories in them by me. They should start coming out by the middle of this year and move on from there. I also just finished up an evil genie story (no, really) for a genie anthology. And yes, someone tells me ‘genie’ and I naturally look for elements and links to the Cthulhu Mythos. 🙂 Anyway, that story has been accepted and should be out sometime this year. I’ve also been invited to write for a bunch more books that I really can’t talk about now. So while I took a few years off from writing for various reasons, I seem to be jumping back into it with both feet. 2012 should be a very good year for me. Excellent story and killer illustration! I quite enjoyed your story and hope that you intend to write some more stories that give us more information of the Order and their history.I look forward to reading more of your work. Thanks, Robert and Terry. I agree that it is a killer illustration and people seem to really like the Order. So yeah, I guess I’ll have to do something more with them in the future. I really liked this story quite a bit, very inspiring to say the least as you can tell by the illustration I did for the story. There is a cold deceptive mean-streak running through this story that will remind you of the tone taken in many of Robert Bloch’s more memorable tales. This tale embodies a dark litmus test, a harbinger of what lays ahead for what’s left of the future. Well done Brian! I’m so glad that you liked it, Nick, and thanks for such an awesome illustration for my story.